..quality research, detailed planning and a well documented execution. That's how we get results. The foundation of an SEO Campaign is KeyWord Research. Ensuring you are targeting the right key terms, and directing traffic to the right pages, can make or break your SEO campaign. There is no point in attempting to rank highly for a term that has little to NO search volume. Furthermore, it is imperative that the page relates to the targeted KeyTerm or a visitor will leave the site as quickly as they got there. 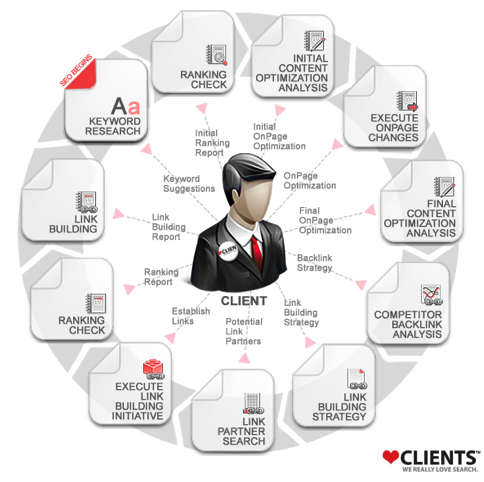 Search Engine Optimization can be loosely categorized into two key disciplines. OnPage Optimization, and OffPage Optimization. We undertake several rounds of a Website Audit, and a Content Optimization Analysis to determine if your website can both be crawled by the search engines & if it would be deemed Contextually Relevant for your chosen Key Terms. We then suggest, and upon approval, make the required OnPage changes to optimize your site for the terms we recommended throughout the Key Term research process. Once we complete the OnPage changes, we focus on building authority for your domain, and subsequent pages in your chosen category. We use a myriad of methods to build backlinks (Considered SEO Currency) to your website, through strategic manual Link Building to Site Promotions, Quality Content, select Directory Submission and Press & Article Releases we increase the overall popularity of your site & begin the wheel of discussion around your product or service. Have questions about SEO? Why not chat with a member of our team now? At a minimum you will be in a position to make an informed decision after a chat with the LoveClients team, even if we can't help, we will be sure to point you in the right direction. Commence a live SEO / PPC chat, with an SEO Expert. We are available 24x7-365. We never close. Connect live with us right now, for a no obligation chat and let us bring clarity to your queries.